30/4/08 — National Heritage — Chambord, Château — On Thursday 29 April, Emmanuelle Mignon, President of the Board of the Domaine National de Chambord (and also head of Nicolas Sarkozy’s cabinet) signed at the Elysées Presidential Palace a contract with the Lefèvre company. 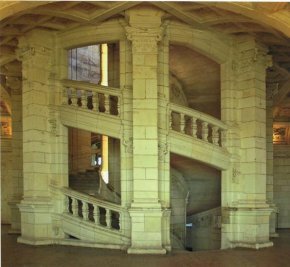 The latter is specialized in the restoration of Monuments Historiques and has been accepted as a patron to restore the château’s central stairway. This patronage consists of the company’s skills and know-how, thus its services will be rendered “in kind”. We should point out that Patrick Ponsot, the head architect in charge of the project is one of the most faithful observers of a monument’s authenticity and of restoration ethics, unlike some of his colleagues. He stated in the press release that it was out of the question to change even a single stone of the stairway ! He also acknowledged that, at first glance, the monument seemed to be in good condition but that it was in fact very dirty as it had not been restored since 1889, at which time it seems that all of the steps were changed. The stairway will be treated as if it were a monumental sculpture. The Public Establishment of Chambord has recently made plans for a complete restoration of the Château over a period of 20 years, investing a total of 20 million €. The more urgent sections had been planned and the stairway was not one of them. But it is obvious that a patron would be more interested in work on a visible and spectacular part of the castle. What really matters is that the work be useful and justified, which is the case here. After an initial study and diagnostic phase which should take until the end of the summer, the site is supposed to begin work in early October and last three years, mostly during the less visited winter period. The restoration of the stairway, representing an equivalent patronage gift of 500,000 €, should be finished in 2011.